The LEGO franchise is unstoppable these days. Regardless as to whether or not they’re stellar-quality, the games see good enough sales that multiple licensed iterations are released each year. First up for 2016: LEGO Marvel’s Avengers. This is the second LEGO game set in the Marvel universe, and allows gamers to run through much of the Marvel Cinematic Universe, and then some. But is this formula worn out, or do these bricks still know a few tricks? LEGO is geared towards kids, and while the story stays strictly E-rated, there are still some good, humorous moments that people of any age will enjoy. Those who have seen every movie that is referenced throughout the game will likely get the best experience. In case you’re wondering, that list of movies includes (take a big breath): The Avengers, Avengers: Age of Ultron, Captain America: The First Avenger, Iron Man 3, Thor: The Dark World, and Captain America: The Winter Soldier. Whew! As you can see, there is no shortage of source material for this game, and Traveller’s Tales uses all the content that they can. 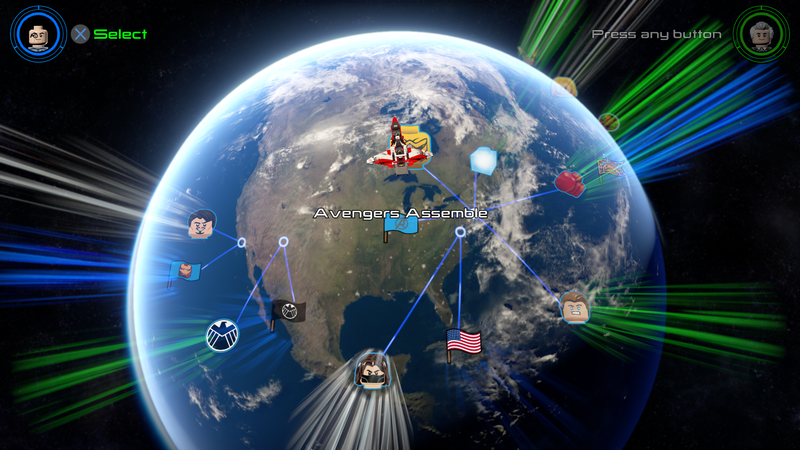 LEGO Marvel’s Avengers is, technically speaking, fully-voiced. For the majority of all character work, sound bites from the movies are used, rather than having any major scripted events that fall outside of the plot from the movies. TT Games does an admirable job coming up with the scenarios in which the LEGO Marvel characters find themselves, as usual. The sound bites are also extracted with a high-enough quality that for the first few scenarios you may not even be aware that you’re listening to repurposed audio. In my playthrough, the first giveaway was then Director Fury, played by Samuel L. Jackson, showed up and hardly spoke. As anyone who has seen any Avengers-related flick can attest, that is one man who doesn’t like to make a quiet entrance. Once again, the PlayStation 4 has little issue running the game at full-speed, with the helpful dynamic split screen mode also available for couch co-op. Graphics are crisp, and since this entry is based off of Marvel movies, cutscenes have a cinematic feel to them. Of course, because this is LEGO you can expect it to have a certain charm to it that few other games can match. There’s a purity to LEGOs, something that evokes a childlike sense of wonder that few toys can do to people of all ages, and that feeling is captured wonderfully in this LEGO game. If you’ve played any LEGO game within the past couple of years, then you will feel right at home with LEGO Marvel’s Avengers. The control scheme has hardly changed. You can control up to five characters in a single mission, swapping between them by a single press of the triangle button. You can also combine the abilities of any two characters when prompted. The resulting combos clear the area of enemies, and are different depending not only upon the duo that you’ve teamed up, but also which character initiated the super move. This means there are somewhere in the neighborhood of 800 moves, quite the impressive number. Equally impressive is the attention to detail in LEGO Marvel’s Avengers. There are a handful of free-roaming areas to explore, from Washington D.C. to the ethereal realm of Thor known as Asgard. Each location has many side quests or mini-missions to perform, with various rewards and unlockables to nab. It wouldn’t be a LEGO game without unlockables, after all, so the OCD among you will be busy with this game for a while to come before you’ve unlocked everything. Stan Lee is hiding in every single level as well, like Where’s Waldo but more challenging. You’ll usually have to re-visit the level with the right set of characters in Free Play mode once you’ve cleared the level in Story mode in order to set Mr. Lee free. It’s a shame there’s a few hiccups in the experience that may or may not bug the regular LEGO game aficionado. To begin with, at least twice in my playthrough, a character became stuck to the point that I could not move them from their spot. This happened when the other characters were unable to assist, as well. The only fix was to restart the level from the last checkpoint. TT Games also assumes that you’ve very familiar with how to play a LEGO game – a tutorial was non-existent, with the game opting instead to occasionally show these ‘A’ logos that you have to break in order to read. This approach is functional, but with the game being targeted towards a younger demographic, I could see the youngest players becoming frustrated with some of the game’s unclear objectives. There’s no indication as to what to do next – not even a pause screen tip or synopsis of what point of the plot you are at. But hey, perhaps this is a subconscious push on behalf of the developer to encourage parents to actually play game with their kids. Crazy concept, I know. Anyone looking for a good family game to play with their kids should pick up LEGO Marvel’s Avengers without delay. It’s certainly cheaper than that other LEGO game that came out not too long ago, and with a playtime of 6-10 hours for just the story mode, and perhaps dozens more to obtain 100% completion, it’s likely any kids you have will play this for months on end. The story is straight from the movies, and is enjoyable for kids of any age – indeed, fans of the Marvel universe will likely have fun here too. Some technical hiccups and the occasional unclear objective can hamper your progress, but these can all be overcome in a game that exudes a fun-loving attitude throughout. LEGO Marvel’s Avengers review code provided by publisher. For more information on scoring please see our Review Policy here.